Ortho Gadgets-What do I do with all this stuff? We live in a technology driven world and orthopedics is no different. We have a device for just about everything. When you come in for an appointment you may be stressed about an injury, your insurance, or the upcoming surgery and what each device does may be clouded. Let's go over a few of the commonly used gadgets in our office so you can have a clearer understanding of why we do what we do. 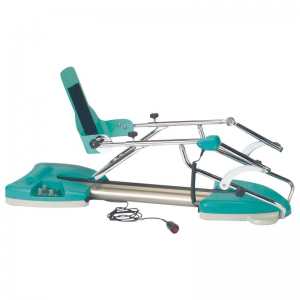 A machine first brought into use around 1985 to test laxity or looseness of ACLs in the knee. It is often still used today coupled with physical exam to test the ACL on both the left and right sides for comparison. We use this test in the office both at the first appointment after an ACL injury, and 12 weeks after surgery to evaluated the ligament. One of our athletic trainers will perform this test on you and we will go over the results immediately after. 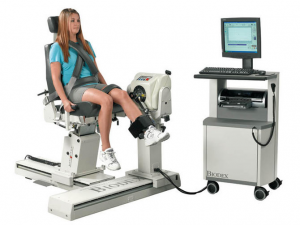 One of our many ACL testing gadgets, the Biodex machine, allows for our therapists to test both the quadriceps and hamstring strength. We often have patients undergo this test around 4 months after their ACL surgery to see how their strength is recovering. 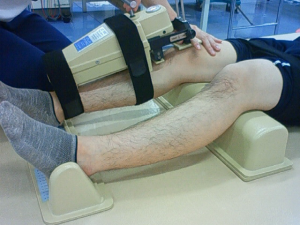 The test will give results after the patient kicks out and pulls their leg back at low medium and high speeds. This will show possible strength deficits in both muscle groups, giving us information on what activities we can allow you to perform. A constant passive motion machine, will move your leg slowly. We often use this machine after total knee, ACL, and cartilage surgery. The machine is recommended for the first 4 weeks after surgery and helps restore the range of motion in the knee when patients are in the early stages of rehab. I find patients enjoy the machine and find it relaxing often using it while napping. 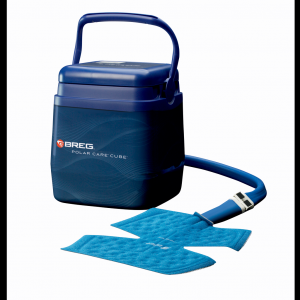 A cold therapy unit is a cooler filled with water and ice attached to a tube and pad. The pad is attached to the shoulder or knee with Velcro straps. The tube and pad circulate chilled water into and out of the pad cooling the surgical area and reducing swelling. Patients tend to love this device! The only rule is to keep something like a towel or pillow case between your skin and the pad so it does not get too cold. 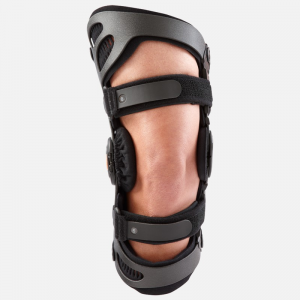 After many of our knee surgeries patients will be placed in a hinged knee brace like this one. 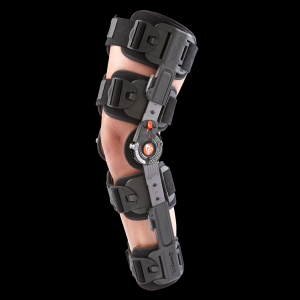 It allows for the knee to be locked straight or restricted in certain ranges of motion with the hinges at the knee. The Velcro straps are very adjustable so people of varying heights and weights can fit in the brace comfortably. If you do not feel you brace if fitting perfectly anymore we can adjust it easily to make it feel better at each appointment! Another brace often prescribed is an unloading brace. This brace also has one or two hinges as well as a dial. The dial is on the opposite side of the knee from the patient's pain. (The pain is often caused by osteoarthritis, lack of meniscus, or cartilage injury) As the dial is turned up the pressure on the good part of the knee goes up, causing the painful part of the knee to open and feel less pressure. I equate this to rotating the tires on a car. Technology doesn't have to be scary! It can greatly enhance your surgery and post operative recovery experience. We want you to have the most complete experience possible and gadgets can contribute to that in many ways!